Do you know San Francisco? 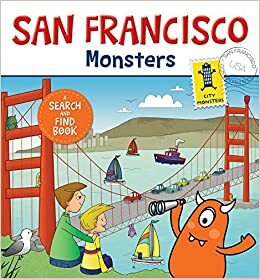 The majestic city on the edge of the Pacific Ocean is such a great place to live that even little monsters have taken up residence there. Did you know that? Monsters are masters of camouflage who can easily hide in plain sight. They sneak aboard the city's famed cable cars, go undercover among the sea lions of Fisherman's Wharf and even roam the Golden Gate Bridge! Have fun spotting them all as you explore some of San Francisco's most iconic landmarks and sights, including Union Square, Chinatown, Alcatraz, the California Academy of Sciences, Alamo Square, Fisherman's Wharf, Lombard Street, the Palace of Fine Arts and Ghirardelli Square.